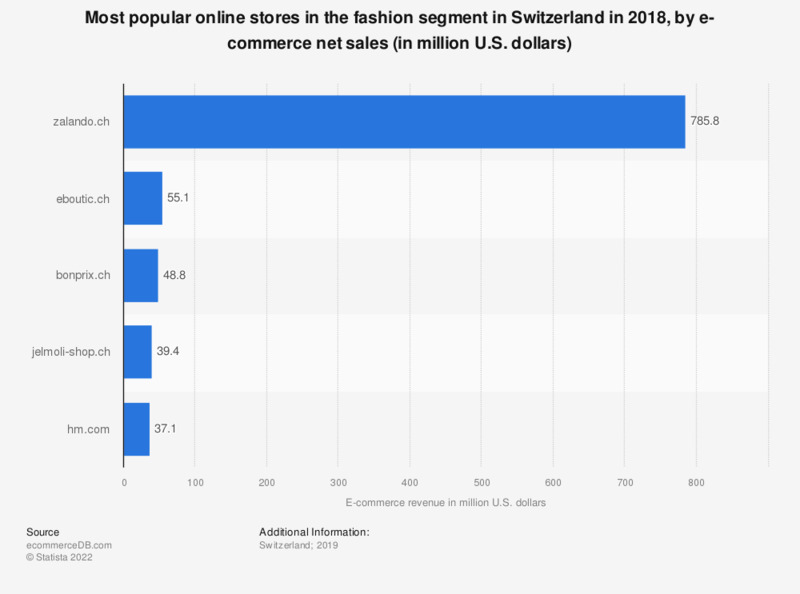 This statistic presents a ranking of the most popular online stores in Switzerland in the fashion segment in 2018, sorted by annual net e-commerce sales. In 2018, market leader zalando.ch generated 785,8 million U.S. dollars via the sale of fashion articles in Switzerland. The online store eboutic.ch was ranked second with a revenue of 52,2 million U.S. dollars. The e-commerce market category “Fashion” includes the online trade of articles of clothing (for men, women and children), shoes and shoe care products (e.g. cleaning products) as well as accessories and bags (e.g. hats, scarves, gloves and leather bags, suitcases, purses and briefcases). Dedicated outdoor and sports clothing, outdoor and sports shoes as well as baby’s clothes are part of other categories (see: “Toys, Hobby & DIY”). Statistics on "Online clothing market in the United Kingdom (UK)"